Be the first to share your favorite memory, photo or story of Wilhelmina. This memorial page is dedicated for family, friends and future generations to celebrate the life of their loved one. 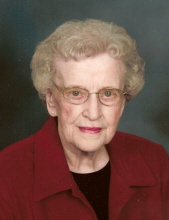 Mrs. Wilhelmina Kraayenbrink, age 92, of Hull, passed away on Monday, February 11, 2019, at the Pleasant Acres Care Center in Hull. There will be a memorial service on Tuesday, February 19, at 1:30pm, at the First Reformed Church in Hull. The Rev. David Van Kley will officiate. Interment will be prior to the service at the Hope Cemetery in Hull. There will be a family prayer service on Tuesday, at 12:30pm, at the Oolman Funeral Home in Hull. Visitation with the family will be on Monday from 5:00pm to 7:00pm, at the funeral home. Wilhelmina Henrietta, who was also known as “Wilmina” and “Mina”, was born on July 4, 1926, on the family farm in rural Sioux Center, the daughter of Gerrit and Hattie (Gerritsen) Vande Kamp. She was raised on that farm. After completing the eighth grade, she worked in area homes as a housekeeper. On January 24, 1949, she married Asa James Kraayenbrink at Sioux Center. They farmed in the Hull area until December of 1991, when the moved into a new house that they built in Hull. Asa passed away on March 5, 1998, at home in Hull, after 49 years of marriage. In December of 2000, Wilmina moved into the Homestead Cooperative in Hull. In June of 2010, she transferred to Pleasant Acres. She was a member of the First Reformed Church, where in earlier years, she had been active in the Reformed Church Women’s Ministries. She also attended the Community Coffee Break Bible Study. Besides being a homemaker and farm wife, Mina was a cook’s assistant at Pleasant Acres for fifteen years. She liked baking, playing cards, embroidering, reading, and adult coloring. Survivors include a daughter, Doris Scholten, of Sheldon; a son-in-law, John Unangst, of Colleyville, Texas; five sisters, Alvina Punt and Henrietta Sneller, both of Sioux Center; Gracia, and her husband, Lloyd Punt, of Pipestone, Minnesota; Helen Mulder, of Munster, Indiana; and Gert, and her husband, Don Vos, of Ripon, California; a sister-in-law and her husband, Delores and Leonard Leenderts, of Hills, Minnesota; and a brother-in-law and his wife, Henrich and Marilyn Kraayenbrink, of Sioux Center. In addition to her husband and parents, she was preceded in death by a daughter, Hillene Unangst; a son-in-law, Harold Scholten; two brothers, Gerrit and Gerald Vande Kamp; a sister, Margaret Sybesma, and her husbands, John Meendering and Syne Sybesma; a sister-in-law, and her husband, Alyda and Donald Wassenaar; and three additional brothers-in-law, Harold Sneller, Donald Punt, and Ed Mulder. In lieu of flowers, memorials may be directed to the Pleasant Acres Care Center, 309 Railroad Street, Hull, Iowa 51239; and the First Reformed Church, 911 Second Street, Hull, Iowa 51239. To send flowers or a remembrance gift to the family of Wilhelmina H. Kraayenbrink, please visit our Tribute Store. "Email Address" would like to share the life celebration of Wilhelmina H. Kraayenbrink. Click on the "link" to go to share a favorite memory or leave a condolence message for the family.